Context: The organisation’s vision has identified in innovation the key element to achieve its goals. The team is already existing and shares a strong identity. Needs: in functioning and efficient structures, habits can represent a risk. The creative process requires to avoid excessive self-confidence that prevents from getting outside the comfort-zone. Activities: Playing outside the box and possibly with subjects external to the organisation. Challenging roles and functions is made easier because the shared identity is sound, the team is solid and new things are perceived positively as opportunities. Creativity comes from reflection and dialogue. Innovations results from processes: it’s not a goal itself, but it’s part of a process. To innovate and encourage creativity, traditional approaches should be challenged and processes should be renewed. There’s no innovation without renovation: repeating known processes and practices leads to stagnation. New solutions that can make the difference and that have the innovative potential, can emerge only when ideas flow, creativity is encouraged and there is a constructive dialogue. Everyone can develop their own creative potential and share it with their team. Creativity is not a talent, but a way of doing that can be learned, improved and shared. Routine and habits are creativity’s enemies. If you want to have new ideas, you need to change the rules of the game and play seriously. Understanding the principles of design thinking through specially designed workshops that enhance a first hand experience of convergent and divergent thinking, allows the teams to share thoughts, integrate and merge skills and appreciate everyone’s contribution, so that new ideas can be built. 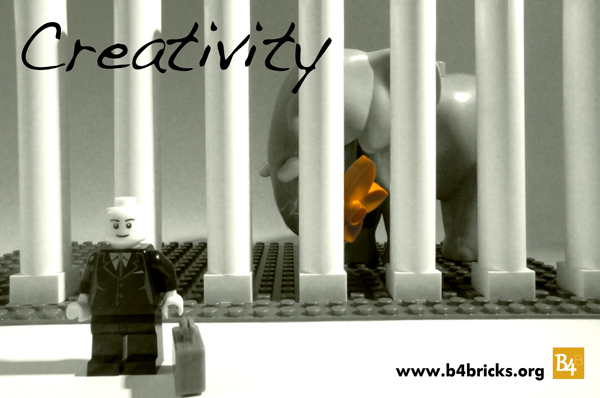 In a LEGO® SERIOUS PLAY™ based workshop, participants engage in a highly creative experience: they will be able to experience first hand new concepts and ideas that can lead to innovation through creative processes that capitalise on collective intelligence and meaning making activities. By changing the rules of the game and sharing experiences and ideas with the clear goal to develop creativity through the LEGO® SERIOUS PLAY™ methods, the team will strengthen the relationships, improve their internal dynamics and produce ideas to be taken further together. During the workshop, the activities will elicit creative processes through imagination, the physical construction of ideas, the meaning sharing activities and story telling. Participants taking part to a workshop, will be asked to explore their individual creative potential, so that they will be able to build collective landscapes or shared ideas that take advantage of every creative spark and innovative intuition emerging from the team. All those who are looking for new ideas for products and innovative processes. Those who will to explore and develop their creative potential and capitalise on the collective intelligence of their teams. This entry was posted on May 4, 2013, 12:48 pm and is filed under Uncategorized. You can follow any responses to this entry through RSS 2.0. Responses are currently closed, but you can trackback from your own site.